A&A's sparth axe fits this period though the haft maybe shorter than you want. Is that A&A (USA)? I could hot find a sparth axe on their web site. Yes, it does fit my period if interest and I have considered it as a possibility, but the only examples I found were from unknown makers (ex: silvermane.com http://www.silvermane.com/Sparth%20Axe.html ). Alexi that was the American A&A but I hadn't noticed that they had dropped it. My brother has one and its very light and fast but that doesn't help you. We have not dropped the sparth axe, it is just currently not listed on the website. But it is listed as item #032 in the pdf download-able catalogue Marvelous weapon! Picture included. Taken from the Arms&Armor catalogue page 22. Glad to hear it Craig. Do you have any figures, even approximate, for the weight and PoB on this item? Afraid I don't have any specs, as it's been about two years since I held one. I just remember it being really unweildy (admittedly, I was holding it in a store where I couldn't swing it around), and the head was really heavy. It would have been very slow to move, and a blade half of it's mass would still have been more than strong enough, so as far as I'm concerned it was way too thick. Yes, A&A out of Minnesota makes a sparth axe but it is in their new line up that you have to download off the site, (I wish they would get that thing updated). It looks really cool and I would get it if I had the dough but I thought this weapon was more in my period of interest (around 1200's). If you see this which is it Craig? The only reference that I have seen dating the sparth axe is from silverman.com (see my one of my previous posts on this thread for a link). 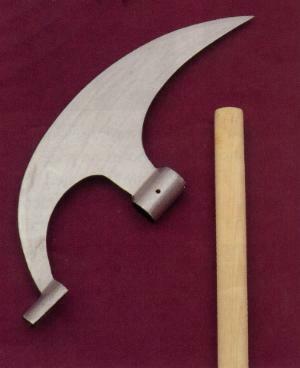 They claim that it was used in Scotland in XIIIc and it was the predecessor of the Lochaber axe. Let's see what Craig has to add to that. Here are a few more examples of earlier polearms in fairly complex shapes for their period. The time frame on these should fall in Alexi's parameters. The morgarten example is based on a surviving piece the others are art sources thus good solid dating. The second group of examples that Alexi posted in the thread shows a similar item to the morgarten example with the added back spike on a separate socket, independent on the main head. This is stated by some as a development that signifies the earlier halberds from the "sempach" variety. I would be leary of making this such a clear cut distinction. Back spikes seem to be a development of the 1320-1340 for mass acceptance, there are definitely examples earlier than this. As to the time frame for the "Sparth Axe". I think you would have to distinguish between the term and the weapon. The Sparth Axe terminology I do not have a hard time envelope to give you. I expect a bit later than earlier. The weapon is almost universal in europe from very early, say 1100 at least to well into the 1600's. It is just a very efficient weapon for resources, manufacture and martial use. It may be redundant, but I am still going to ask. Have you seen anything like the XIVc "glaive?" that I included in my first post? Where might it be from? How long would the haft be? In my opinion it appears to be one of the most elegant of the pole weapons falling within the period of interest (that we saw representations of). I forgot. I was going to comment that this style of pole arm is very common in the art, from quite early on. I would say in the 1200 to 1250 range there are numerous examples and it continues right through the period. I will try to detail a few as soon as I can. Click on any or all of the highlighted volume numbers in the text and you'll get a directory of all the illustrations in that volume. It's an incredibly rich resource. You'll enjoy looking through these, and I bet you'll find evidence of the weapon you're interested in. Take special note of the bill shown at center below and the bardiche(?) shown atop the battlements. A couple more. It's interesting to see the length of these weapons. Taking into account the shorter average height of the bearers, it looks like many of these weapons are around 6' long. That makes me feel better about the length of the Windlass voulge and Swiss axe, because I wondered if they were ahistorically short at 5'7" and 5'9", respectively. 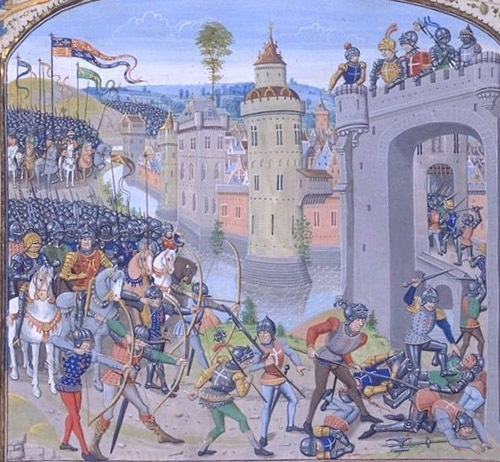 There seems to be significant variety in the length of the hafts shown in Froissart. Now I'm REALLY wanting that voulge! Thanks for the link. I enjoyed looking through it. 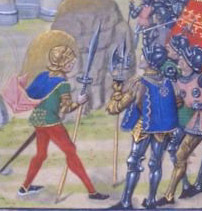 That morgarten 'halberd' is I think more properly a volgue, as it has more of a cleaver like blade than the smaller axe - like blades of later halberds, which also often had that funny convex shape. Most of the depictions of early swiss 'halberds' seem to be volgues of this sort. Osprey Military books "The Swiss at War", by the way, is a good source for this. 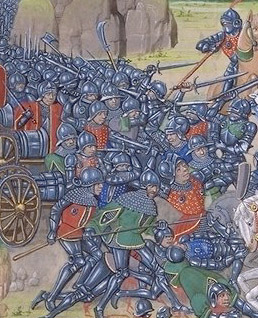 I think the lattter types were more specialized for cutting through heavy armor. I saw this "english partisan" pole weapon at museum replica's web site. I would have called it a "glaive" but that is just me. I think that similar weapons were used during 13-14c, so it might be a viable choice for a period pole weapon. Since it comes unmounted, I might be able to get around some of the problems people have experienced with mrl shafts, provided I an mount it properly As expected, I am asking for opinions and comments on this particular product. In an earlier post on this thread several favorable comments were presented on behalf of the mrl german voulge and the swiss poleaxe. Since the mrl products are hit-or-miss I wanted to get an opinion on this "partisan" as well.